The World’s Ball #WorldCup @FIFAWorldCup « Adafruit Industries – Makers, hackers, artists, designers and engineers! Early soccer balls were hand-sewn and made of leather. They were never perfectly round, and inflating them required some skill. The laces had to be undone before an interior air bladder was filled and tied with a thread; then the laces were retied. 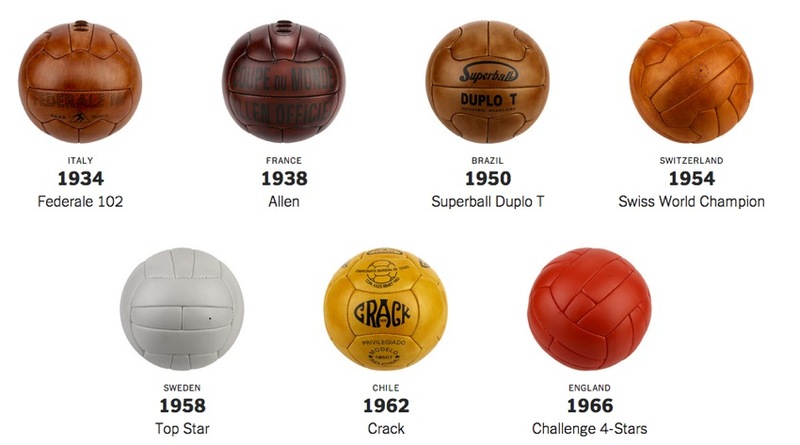 Team captains chose a ball before each match, and every team had a preferred design, according to Peter Pesti, a collector and expert on World Cup balls. In the first World Cup, in 1930, Uruguay and Argentina could not agree on which ball to use. The first half of the match was played with a model favored by Argentina. The second half was played with Uruguay’s preferred design, the T-Model. Argentina led, 2-1, after the first half, but Uruguay recovered in the second and won, 4-2.